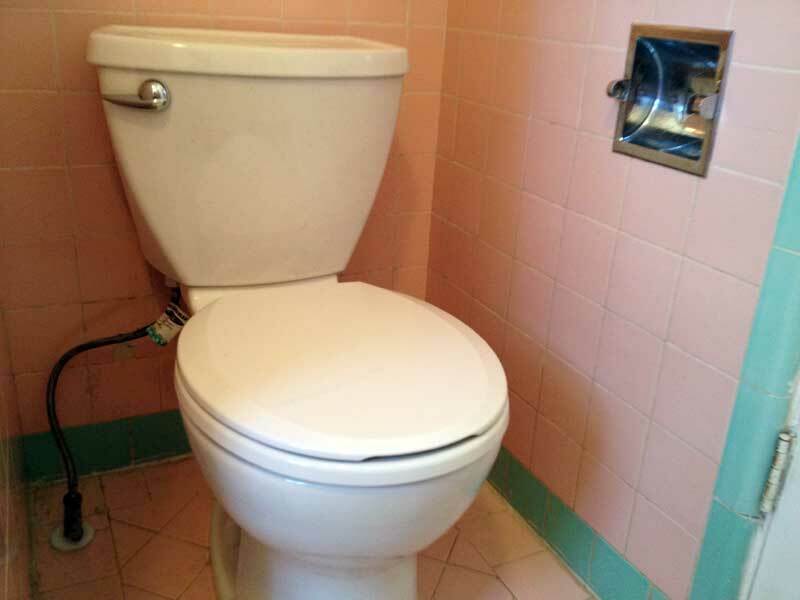 One DIY project we’ve never tackled is installing a toilet. It’s a common job but one we’ve somehow avoided. Not anymore! We live in a 2 bedroom/1 bath bungalow and our old toilet is the only one in the house. We’ve been wanting to upgrade our toilet for some time now as the plastic pieces around the lever and inside the tank have worn and there is a continuous slow leak. We’ve done our best to replace parts as needed and make proper adjustments but it’s time to move on. The lid is also extremely annoying as it is easy to slam down and in a house with a napping baby it’s not the noise you want to hear. Here’s the old offending model that needs to be replaced. So when we were approached by Home Depot to check out the American Standard Cadet 3 toilet we jumped at the opportunity, even though it mean installing a toilet which is a task we were a bit apprehensive about. But after spending an hour on the install and and realizing how easy it was, we feel silly that we were ever concerned about installing a toilet. But when you only have one toilet in the house you had better make sure the installation goes well and it definitely did. The Cadet 3 comes in a variety of options but the first thing you need to determine is the rough-in size which means the length from your wall to the center of the attaching bolt. Ours measured 11 1/2″ which was perfect for the standard 12″ rough-in. This toilet also comes in a 10″ rough-in. We wanted white and a round bowl. If you have a bigger bathroom you may want to opt for the elongated bowl for more comfort but with our bathroom being as small as it is we couldn’t spare an extra two inches. The Cadet 3 toilets are also WaterSense rated which means they only use 1.28 gallons per flush which is about 20% less than most toilets. We wanted to share the simple process which is well documented by American Standard in the included instructions. Apologies for the grainy photos as the bathroom lighting wasn’t the best but hopefully you will see how simple the process was. The toilet arrived from Home Depot in an easy to handle box. Unpacking was a cinch and after pulling out all of the pieces we were surprised at how simple it looked to put together. Our little guy was really into helping us take inventory of everything and he was thrilled to stand and hold the toilet as he knows he’s not allowed to do that in the house. All of the moving parts in the tank were pre-installed and the toilet came with the bolts and easy-handle wrenches required to install the tank and the toilet seat. The old toilet had probably been in use for at least 8-10 years. There was old dried up calk around the base of the toilet which signaled that at one point the toilet was leaking out the bottom. To remove the old toilet we first turned off the water line then flushed the toilet to remove the excess water from the tank. We then soaked up the remaining water from the bowl. There are two bolts that hold a toilet to the floor and using a screwdriver we popped off the caps then used a socket wrench to remove the nuts. Lifting the toilet from the floor is awkward as the entire tank and toilet come up. We probably could have removed the tank but it was easier to just grab the whole thing. After removing the old toilet we were left with a old ring on the tile and remnants of the old wax ring. Removing the old wax ring probably took the most time as we wanted to make sure the new ring had a good seal against the sewer pipe. After removing the old wax ring with our hands and putty knife we pulled out the old bolts that held the toilet down. Now the new toilet was ready to be installed. The toilet kit included two bolts which you place into the slots around the sewer pipe (There has to be better terminology but we’re not plumbers). Take the wax ring and place it on the base of the toilet with the plastic flange facing out. Then lift the toilet base and gently lower it over the two bolts and firmly press down evenly. You’ll feel the wax ring compress and see the toilet close the gap to the floor. Don’t remove the toilet after doing this as you may break the seal. Use the two included plastic nuts and tighten down the toilet by hand. Don’t over-tighten. The base should now be firmly planted on the floor. We have a 12″ rough-in which is the standard size for a toilet so we knew our tank would fit perfectly against the wall. Before installing the tank, attach the rubber gasket to the bottom of the tank then slowly lower it onto the toilet base and thread the bolts through. The kit includes the nuts and handles needed to tighten the tank to the bowl so hand-tighten both of those. All that is left is to re-attach the water hose to the tank, attach the tank cover and install the seat. The Cadet 3 comes with an adjustable seat so you can move it forward or backward depending on your comfort level. We left ours in the middle position. When we were ready to test we crossed our fingers and turned on the water. A hissing sound came from the tank and it quickly filled to the exact level it needed. No leaks so far! We kept our fingers crossed as we did the first flush and again no leaks! Here’s a quick video of our installed toilet. You’ll notice the toilet flush is very strong and it fills the bowl up quickly. The tank is also nearly silent so you don’t hear the water refill. It’s also comforting to know that this toilet is water sense rated which means it uses only 1.28 gallons per flush. If you are holding off on installing a new toilet because you think you need to hire a contractor, consider how easy the Cadet 3 is to install and if you’ve got an hour or two to spare you will have a new toilet up and running in no time.